A Pearl of a Press! I am so excited! 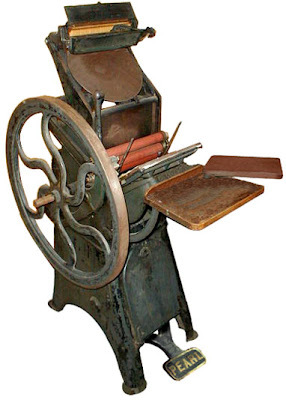 I have been scouring and annoying letterpress people and dealers up and down from here to the midwest looking for a Golding Pearl Improved for the whole summer. And just when I had given up and started trying to justify putting one of those large 1,000lb presses on the 4th floor of a residential building, one of the people I had contacted called and told me he had a Golding Pearl for me! It's a Golding Pearl Improved 7x11, like in the picture above, but without the the automatic inker on top and also without the treadle (foot pedal). It does have a cool homemade variable motor system, though! I'm excited to bring it home and get to work fixing it up! Now it's questionable whether I will keep my tabletop Golding Official #4 or not. I haven't decided. I just spent a lot of time cleaning up and restoring the Golding Official, and, as you can see, it prints great. I know there are a lot of letterpress enthusiasts out there that would love to have a press like the Official, but at the same time, it's my first press and I do love it. But I'm unsure that I really need two presses. Oh what to do! So, as you know, what makes Joie Studio special is our ability to provide not only custom letterpress services, but to take print design and put it online (or vice versa)! It's our "Complete Joie" package, and clients opting for this option get a great deal (at least, I think so!) 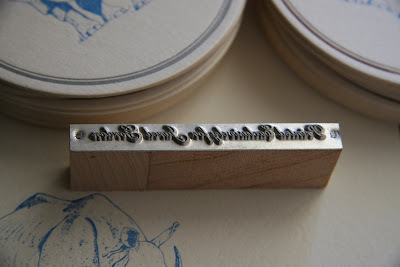 on both custom letterpress and web design. It's becoming so important for brides and grooms to have a website. 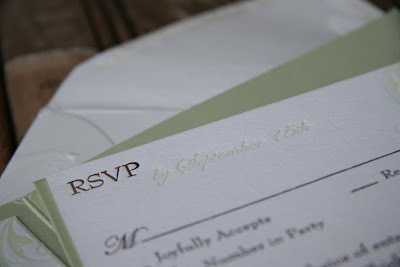 It's a means to communicate information that will not fit in wedding invitations and to answer questions that are frequently asked. It's also a central place to share photos and keep travel discounts, hotel information, and longer directions. 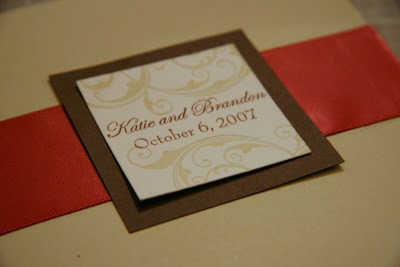 The entire website can be seen at http://joiestudio.com/katie-brandon and at the domain name that the happy couple registered as well. So my new website has been up for less than a week, and I've only just figured out that info[at]joiestudio.com isn't working properly. The techies are on it, but in the meantime, my business cards with that email address are useless. If you have ever have trouble emailing us at that email address, you can always catch us at joiestudio[at]gmail.com. Soft opening of Etsy Store soon -- starting up a mailing list! So it's been quite a month! I'm finishing up some printing projects this weekend, and then it's time to turn my attention to opening up shop. I've decided on opening up an Etsy store, although eventually I will have stuff on my website to sell. I believe I will have a soft opening in early September, where I'm going to put up letterpress printed items, including some coasters, card sets, and greeting cards, up for sale at "Pre-Grand Opening" prices (in other words, super low, almost at cost). This is my way of saying thanks for all the support on this blog and is meant to give friends, staunch supporters, and clients an early chance to get some letterpress items and provide me with some feedback. Included in this sale will be the linoleum print cards of Jezebel (the cat) and Romeo (the dog). I'm going to donate 50% of the proceeds to an animal organization in light of all these horrible things coming up in the news (Michael Vick, Buxton puppy mill, etc.). I won't be announcing the soft opening of Joie Studio's Etsy shop, so if you would like to be informed of this sale, please join our low spam mailing list by emailing me at joiestudio[at]gmail.com. Joie Studio Website Up and Running! Yay! Joie Studio's website is up and running! 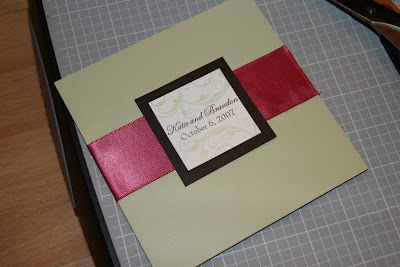 You can find it at http://www.joiestudio.com. 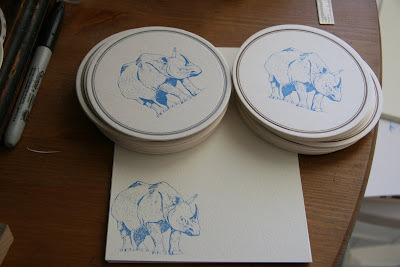 I finally finished the letterpress set of rhino coasters, which is an exclusive for my good friend Jared, who is a collector of rhino goods. While it was on the press, I also made Jared a bunch of A7 notecards, because, well, it's always handy to have nice letterpress cards with an antique rhino illustration around. Happy birthday, Jared! Sweetening the Pot...Discounted Web Design! I was chatting about web design the other day when I realized that I've been sorely neglecting networking for more web jobs while I've been setting everything up for Joie Studio. So, to fix that, I am packaging 50 complimentary 1-color, letterpressed business cards, calling cards, or personalized stationery with any web contract right now. For anyone who is ordering custom letterpress wedding invitations or baby announcements, I am offering 30% my normal web design rates. 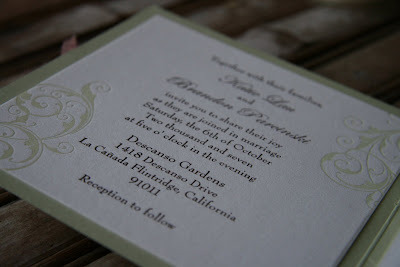 For anyone who wants over 200 letterpress invitation suites, I am offering a custom designed wedding website (up to 8 separate pages) made for free (hosting and URL fees extra). This offer is only available for a limited time. Contact me directly for more information. So my goal was to have my new website up and ready, but I've been busy finishing up printing projects, photographing everything I've done, finalizing some designs for the holiday season (yes, already!) 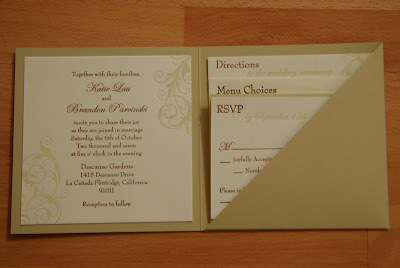 and my first ever wedding invitation line, so the website has been delayed for just a wee bit. 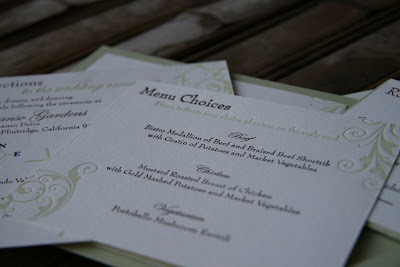 While I'm working on the designs, I thought I would give you a sneek peek at what I've been up to. 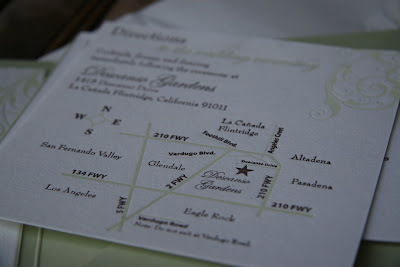 I'm creating wedding invitations that are organized around specific themes. 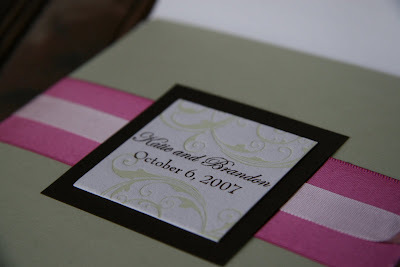 These designs are the jumping off point and are fully customizable. All the ink will be mixed by hand and custom matched to whatever color my client desires, and I'm getting a font list ready. I'm working on the pricing sheets, but if anyone is interested in either of these designs or if you want to see the other designs in the wings right now, let me know! I'm also working on 2008 letterpress desk calendars. I've got 2 different calendars designed, which is really ambitious, since 100 calendars means printing 1,300 good sheets. But here is a sneek preview of my flower calendar, which I've tentatively named "Flowering Joie 2008." In Japan, the cherry blossoms are in full bloom in April, and the country celebrates with a huge cherry blossom festival. I've always associated cherry blossoms with April, so it's only fitting that I use them as April's flower. Any one of the flower motifs used in the calendar can also be used for custom design, so I think this is a nice way to get a letterpressed sampler of Joie Studio. I am starting a presale since these are going to be limited runs. Presales will get a special bonus! Contact me directly if you want to be notified when the presale begins in early September. I'm also in discussions for a Christmas collaboration with an exciting indie designer. I'll let you know if it works out! Enjoy everything I have in the works! And keep an eye out for the new website. Whew! What a load! 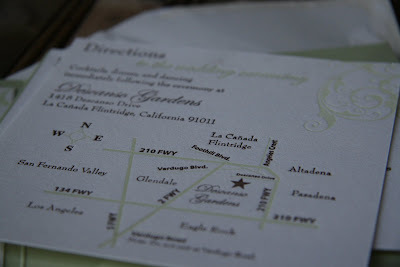 I'm especially proud of how the direction cards turned out. These required pretty exact registration between the map lines and the map wording. I love the results! 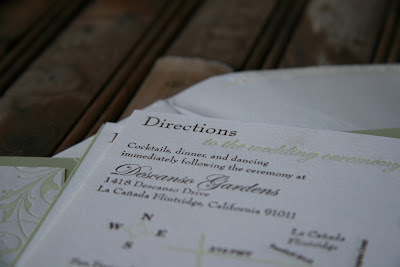 The direction card is probably my favorite part of the whole invitation suite. 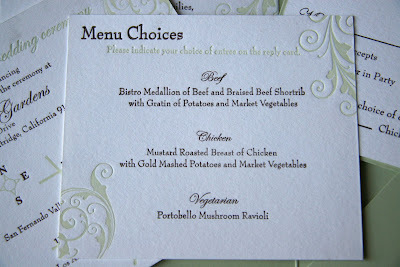 Here are the menu and reply cards. 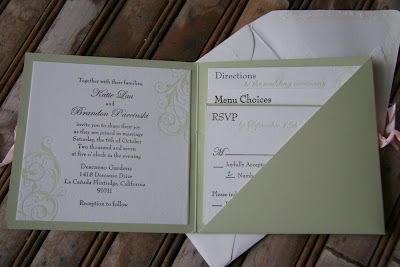 I especially love the sage green wording to complement the chocolate brown! For some inexplicable reason, Picasa will only let me post four pictures at a time. So be it! 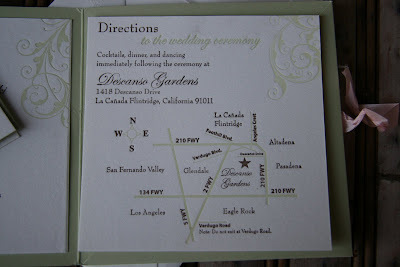 Here are pictures that I took from the invitation that was sent to us by the bride and groom. 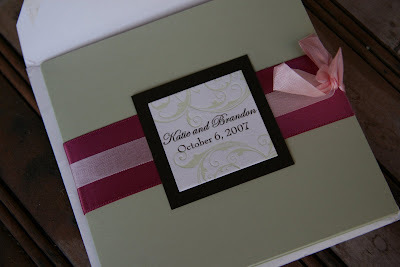 The bride added a second pink ribbon to the design. Here it is, straight out of the envelope! I'm almost done with the new website for Joie Studio! In about a week (maybe less! ), I will be launching Joie Studio's official business website at http://www.joiestudio.com. If that's how you've been getting here to this blog, don't worry, the blog isn't going anywhere, and there will still be a link to this blog from the new website. Whew! So I got the plates from Owosso Friday, I letterpressed this set of wedding invitations on Saturday, Sunday, and Tuesday, and the bride and groom picked them up Tuesday night! 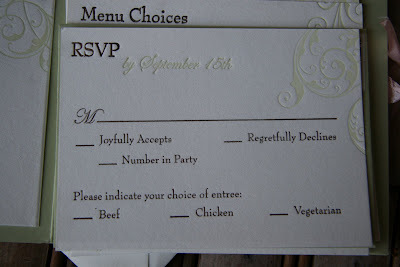 Needless to say, they are as happy as can be with these invitations. I'm glad, because it was a lot of hard work to get this job done by the deadline. Two of the plates I ordered were bad, but I called Owosso Monday morning and they had plates to me the very next morning to complete the job. The job went really fast compared to the last set of invitations, and now I can take a break. Which is good, because we're off to Hawaii today for a wedding this weekend! Are the Rubine Red, Pantone Yellow, Process Blue, and Opaque White the only colors you use to mix with? I also have a PMS Guide and want to avoid spending $100 ordering 1lb cans of ink in all the colors so I'm trying to figure out which basic colors I can get by using to mix the PMS colors. 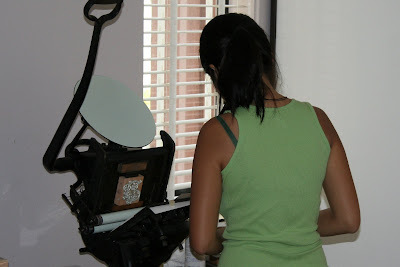 First, there's a great discussion on ink on Briarpress that you can look at that gives you tips on ink. I found it particularly helpful. You can order some lithographic ink to save some money, which tends to come in smaller cans and therefore cheaper. 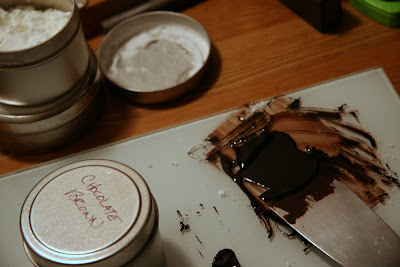 However, since it's oil based, it will dry in can, which, along with ease of cleaning, was a huge concern for me when I was deciding what to do in the beginning. As you know from the post about ink, I started off with Rubine Red, Pantone Yellow, Process Blue, and Opaque White rubber based ink. I got black as samples from a bunch of places, and I also purchased metallic gold (from Accent) and silver (from Van Son) oil based ink because I have a thing for metallics. I chose these particular colors after thinking about what colors I would initially be using and going through the PMS color guide and seeing which red, yellow, and blue matched my needs best. I still use these colors extensively, but I've found that I have needed other colors as well. Luckily, I have a friend who is also starting her own letterpress studio and her initial needs were Red Pepper (PMS 199), Pantone Yellow, Pantone Green, and Reflex Blue. She also decided to get a mixed Chocolate Brown (a must in this design time). Then we met and traded inks. I figured out later that I really didn't need Red Pepper from her since it's based on Rubine Red, but I've used that as a basis for Joie Studio's pink (added white) and red (added black) business card colors since it's easier than starting from scratch. I also mixed the Pantone Green with the metallic silver for the blue-green coasters I did recently. I also just stole a little bit of Warm Red and Pantone Purple from her. Next on my list to acquire will probably be Warm Red and PMS 8560, but I'm waiting for that design project to start before buying. My advice to you is to look through the book and decide what colors you absolutely need, then buy more colors as you go along to spread out the cost of ink. At the end of the day, $20-$25 every now and then isn't so bad. My initial purchase of those 4 pantone colors plus the metallics probably set me back well over $100, so it's not cheap, but I figure that the rubber-based inks will last me for a long time, as opposed to the 1/4lb cans of oil based inks that may dry up on me before I get to use a significant amount. In letterpress, a little ink goes a long way. The Chocolate Brown run is done for the night! And I'm done as well! Hopefully I will have the strength (and time!) tomorrow to tell you more and post some pictures. So usually you won't see pictures like this, because I'm usually the one taking pictures of my work. 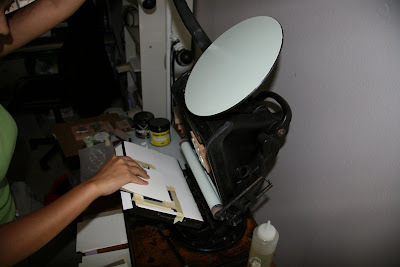 And since I'm deathly afraid of getting ink all over the camera, it's rare for me to have pictures taken during the process of making the cards. But my husband was home yesterday, and he happened to catch some of the action while I was doing the sage run. Another Day, Another Press Run! So for the second day in a row, I was printing on my letterpress from mid-afternoon into the night. It's around 1AM now and I am just putting my feet up for a moment before cleaning the press off. Whew! Today I did just one color -- Paper Source's sage on Crane's Lettra for the wedding invitations that I'm working on right now. 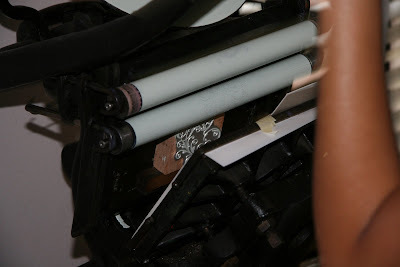 I've learned a couple lessons on setting the platen that I'll share with you once I get the second color on -- it'll be easier to see what I've devised in the chocolate brown ink I'm doing next. But let me just say a word or two about Crane's Lettra. Every other letterpress blog has been raving about Lettra, but I was hesitant because, well, how could it be better than handmade paper? This is the first project I've really worked with the Lettra stock, and WOW I'm impressed with the results. The paper is super soft with a very nice texture, and it takes impression so well I'm only sorry I didn't figure this out sooner. And for the price, it's so worth it. Now, back to the press to clean it off for the night so I can start bright and early in the morning! Pictures of the project soon, I promise! So I haven't been doing much printing lately. Frankly there's been a lot of personal issues. But today was back to the press, and with some great results. 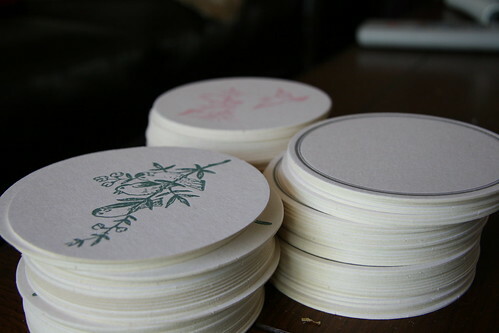 My friend Carrie had gotten a bunch of coasters, and she gave me some to try out. I finally decided to make the coasters a gift for a friend and a vintage-y bird motif as one of Joie's inaugural etsy items. If you want to see more, I've put the pics up on my flickr page. Enjoy! What kind of die cuts are those? They don't look photopolymer. Do you have good success with them? To answer these questions, first, let me address handsetting type. I don't generally handset type because, first and foremost, I don't have a lot of room to keep a wide variety of type in different sizes and fonts. Secondly, it costs a lot of money to amass the collection of type that I would want to do the things I do right now. Third, it would take forever to set and reset type on the whim of my clients. Fourth, it's a lot easier to have a custom plate made. Fifth, there are some designs that I use and that I create that are not available, so I need to make custom plates for those. Sixth, setting type is a labor of love, and while I like to do it, I would do it only for personal projects because of the time and effort it takes to handset type. Platemaking is fairly inexpensive, although in the long run you do pay for the convenience. With type, it's a one time charge per font face and size. But I get exactly the layout and type I want, I can send electronic proofs for clients to look at and revise before I get started, and once it's done, I have the option of giving the plates to my clients for safekeeping in case I run out of room. 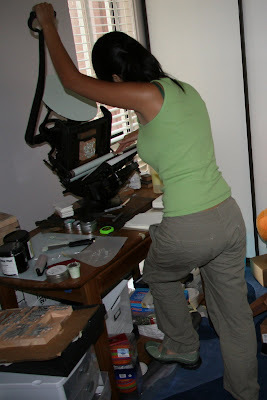 I don't use photopolymer plates. When I first looked into them, I didn't quite understand them (still don't, really, although I hear they are easy) and the base and photopolymer plates seemed more expensive than what I was already using. Although photopolymer plates are easier to store and you can cut them up and reset them in any number of combinations, I have heard that the impressions aren't as good as with metal plates and they degrade much faster than their metal counterparts. I use 16 gauge magnesium plates mounted type-high on wood from Owosso Graphic Arts (see their link in the sidebar on the right). They have a same day turnaround, and through Priority Mail, I usually get the plates 3 or 4 days after I send them the digital file. I've been very happy with Owosso's service and pricing, and, as the saying goes, if it ain't broke, don't fix it!